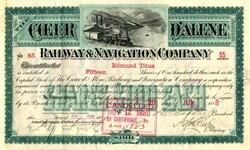 Beautifully engraved certificate from the Coeur d'Alene Railway & Navigation Company issued no later than 1888. 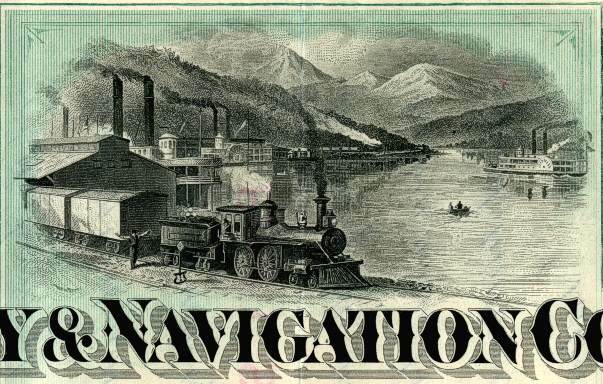 This historic document was printed by the Franklin Bank Note Company and has an ornate border around it with a vignette of a train passing by right along the side of a river with mountains in the background. This item is hand signed by the Company's Officers ( D.C. Corbin ) and is over 122 years old. In 1886, Daniel C. Corbin , Sam T. Hauser, Anton Esler, S.S. Glidden, James Wardner, and James Monaghan formed the Coeur d�Alene Railway & Navigation Company. The primary purpose was to connect Northern Idaho from the Coeur d�Alene River to nearby mining regions. The road was leased in 1888 to the Northern Pacific Railroad. The road was later sold to the Northern Pacific after foreclosure in 1897. Daniel Corbin discovered the Bunker Hill and Sullivan mines in the Coeur d'Alene Mountains of Northern Idaho in 1886. Corbin helped erect the first concentrator at the mine sites. Corbin then built the Spokane Falls & Idaho Railroad and the Coeur d'Alene Railway & Navigation Company, which connected the starting poing point of Spokane with those lead and silver mining districts. Corbin also developed the Spokane Valley Land and Water Company, bringing the Spokane Valley its first irrigation project in 1889.